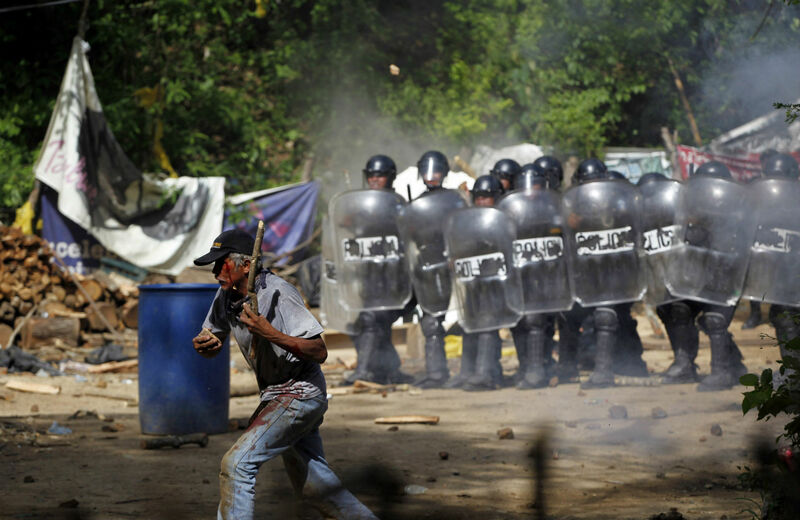 The resource wars in Latin America are heating up, and the poor are paying the price. The temperatures are rising and so is the body count. Every year, more and more environmental activists—many of them first peoples on the front lines of the new global resource extraction wars—are killed. In 2010, the number was 96. In 2011, 106. Last year, 116 people were murdered defending their farms, community, or livelihood in land, logging, dam, or mining disputes, according to a new report out just in time for Earth Day by Global Witness. Two-thirds of the killings take place in Latin America, according to the report, How Many More? Brazil at 29 murders and Colombia with 25 are the highest in total numbers. But Honduras, with 12 assassinations, is the most dangerous place to be in the world for a grassroots environmentalist, in terms of per capita killings. Global Witness highlights Honduras as a case study in its report, and the chapter is well worth a read. The 2009 Honduran coup (which was pushed by the neoconservative right in this country and eventually sanctioned by the Obama administration, with Hillary Clinton as secretary of state legitimating the putsch) was about many things, as Dana Frank and I wrote about at the time in The Nation: a reforming president, Manuel Zelaya, who apologized for the security forces’ social cleansing (that is, murder) of “delinquents”; who signaled his tolerance and support of LGBT activists; who began to make the morning-after pill legal; and who tried to raise the minimum wage. But one of the main flashpoints of the conflict that led to Zelaya’s ouster was his efforts to regulate resource extraction, namely mining, hydro-electricity, logging, and biofuels. Central America, particularly Honduras, El Salvador, and Guatemala, is caught in a new cycle of rural dispossession, as sweeping as the twentieth-century heyday of coffee, cotton, banana, and sugar export. Under the Wild West terms of post–Cold War “free-trade” treaties, land that might be used for subsistence farming, or to grow crops for the local market, or kept as bio-diverse forest, is being ripped up and dug into. Water is poisoned or diverted. In the midst of neoliberal abundance—with Walmarts, or Walmart-owned megastores, sprouting up in every major city—children are dying of malnutrition, as land that used to provide basic staples is put to multinational profit. And Zelaya, six years ago, tried to regulate rural resource extraction, allying with peasants and environmentalists (such as José Andrés Tamayo, a Catholic priest who in 2005 won the Goldman Prize for environmental activism for his work with rural communities to oppose commercial logging; this year, the prize went to another Honduran, Berta Cáceres, who helped the indigenous Lenca oppose a mega-dam). For that, among the other reasons cited above, Zelaya was felled in what New Yorker writer William Finnegan aptly called an “old-fashioned coup.” Today in El Salvador, the powers-that-be are opting for a more modern solution: mining interests are suing El Salvador for its mining ban in international trade courts, since under the terms of the Central American Free Trade Agreement, “corporations can sue governments if they perceive that government actions threaten their future profits.” Some will rob you with a six gun, others with a fountain pen (the Obama-pushed Trans Pacific Partnership would extend such corporate power over nearly the whole Pacific rim, making the trade treaty as destructive an instrument as bulldozers and guns). The Honduran government recently passed, in 2013, a new “general mining law” which removed a moratorium on new mining project. Since then, Global Witness points out, “4 activists have died due to their opposition to mining projects.” Since 2009, the fertile, lush Aguán Valley, home to small scale peasant communities, has become a war zone: 82 campesinos fighting agribusiness have been executed between 2010 and 2013. Although information on the perpetrators of violence against defenders is hard to verify, in many cases private security companies used by mining, hydropower and agribusiness have been suspected of involvement. Private security guards were implicated in 13 of 29 killings of campesinos in Bajo Aguán investigated by Human Rights Watch between 2009 and 2013, for example. Similarly, the 2013 visit to Honduras by the UN Working Group on the use of mercenaries voiced concern about the alleged involvement of private security companies hired by landowners in serious human rights violations, including killings, disappearances, forced evictions and sexual violence. And instead of being funded directly by Washington, the alliance is capitalized by multinational “development” institutions. Again, here’s Global Witness: “The World Bank’s private lending arm, the International Finance Corporation (IFC), loaned US$30 million to Dinant, a palm oil company tainted by assassinations and forced evictions of farmers in Bajo Aguán and owned by one of Honduras’s richest and most powerful businessmen [and 2009 coup plotter], Miguel Facussé.” (In 2009, Teo Ballvé in The Nation reported on USAID funds used to finance biofuel plantations on land stolen by paramilitaries). To keep track of the blood spilled in this new phase of intensified dispossession and resource extraction, along with all of Latin America’s diverse food sovereignty, anti-GMO, and environmental activists fighting for a dignified life, these websites and organizations are indispensable: Upside Down World, the Americas Program of the Center for International Policy, Rights Action, NACLA, CISPES, the Network in Solidarity with the People of Guatemala, and La Via Campesina.